Northern Ireland suffered a 2-0 opening loss in Group A to Spain at the Women’s UEFA U19 championships in Belfast on Tuesday night. But they put up a brave performance against a side which has previously won the tournament and appeared in the last three finals. 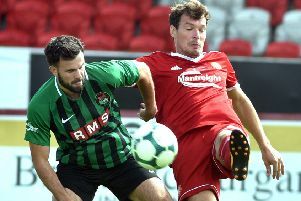 Northern Ireland skipper gives here reaction to the loss and also looks ahead to the next group game against Scotland at Mourneview Park, Lurgan, on Friday night.